Creston Mountain Properties, LLC is a full service realty company specializing in land & home sales in Creston Community. Jane Basford, Owner/Broker, is a full-time resident of this environmentally conscious community. And, Jane and her fiancé, Steve, actively built their dream home here. Jane has over 12 years of real estate experience and it is her pleasure to serve customers who want to call this mountain sanctuary their home.Want to know more about living in Creston? 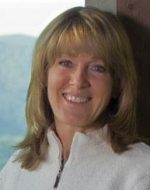 Jane has first-hand knowledge & experience to answer your questions concerning land sales, purchase, and the process of building your dream home in this magical area of WNC!